Why Your Dog Is Digging Up Your Garden... And How To Stop It. Why Your Dog Is Digging Up Your Garden… And How To Stop It. When you see your dog digging unsightly holes in your neatly landscaped garden, your first instinct is to run at him, yelling at him to stop. While this may turn his attention away from his excavation efforts in the short term, it won't be long before he is again hard at work. The only way to put a stop to this unwelcome behavior is to work out why your dog is doing it, and deal with it appropriately. 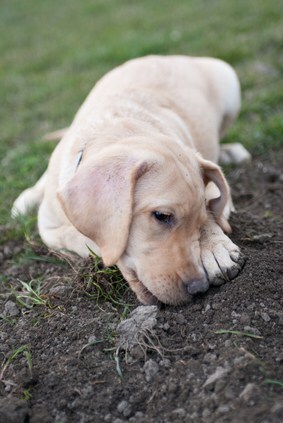 There are many reasons why your dog may be digging. And know what they are is a first step towards stopping the dog digging. If there isn't much for him to do while you're out at work all day, don't be surprised if he makes his own entertainment. This often includes digging but he may also chew things and pull laundry off the washing line. 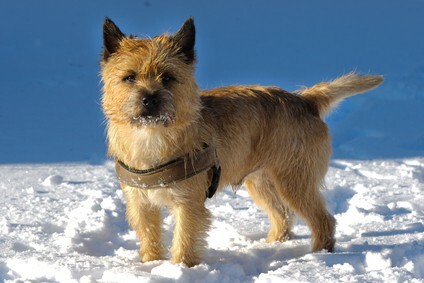 Some breeds, particularly terriers such as the Cairn Terrier, are hard wired to dig. They were bred to go to ground after small prey, and digging is instinctive. In warm weather, your dog will dig a shallow hole to lie in, because the ground just under the surface is much cooler. Some dogs just want to escape their yard, perhaps to go after a lady friend in season, or to just find a playmate. Digging and destructive behavior both inside and outside your home can be characteristic of separation anxiety. This is an urge to eat abnormal materials such as dirt and soil. Your dog may dig up the ground before he eats it. First, If you own a digging dog, it's important that the bottom of your fence is reinforced with chicken wire or another type of physical barrier. This will prevent him escaping and getting injured. If he is escaping to find a lady friend, have him neutered and he will be less interested in this. Some people blow up balloons and put them in a hole then cover them with dirt. When their dog digs, the balloons burst and give him a fright. This is an instant negative reinforcement and may work for you. However, it's very hit and miss. Your dog may not dig in the area with the booby trap, and if you encourage him to do so, you're giving him mixed messages. Besides blowing balloons and digging holes just seems like a hole lot of work, so this won't be my first choice, but it may work for your circumstances. If your dog is feeling the heat, give him a comfortable bed in a shady spot, so he doesn't need to dig holes to find a cool spot to lie in. A bored and lonely dog will appreciate food dispensing toys while you're out and about. Consider a Kong Wobbler or a Buster Cube to make his breakfast kibble last a lot longer. Perhaps you can arrange to exchange dog sitting duties with a friend or neighbor so both dogs have company. If not, you may be able to budget for a day or two at a doggie day care center. Increased exercise will tire your dog out and make him less interested in digging holes. The best way to exercise him is to take him power walking or even jogging. A gentle stroll isn't enough to use up his energy, you'll need to up the pace a little and get his heart beating quickly. If your dog digs because he is anxious, then it's time to speak to a veterinary behavioralist about how to manage his behavior. If you just work at stopping the digging, then you're not tackling the underlying problem and you aren't likely to be successful. What about the terrier that digs just because he loves it? This is easier to manage. Give him some area where he is allowed to dig, and let him tunnel away to his heart's content. This can be a sandbox in the corner of the yard, or a children's plastic wading pool. Fill it with soil or sand, and encourage him to dig in it by hiding treats in there. Whenever he goes to dig anywhere else, gently guide him back to his sandbox and reward him when he starts digging in it. 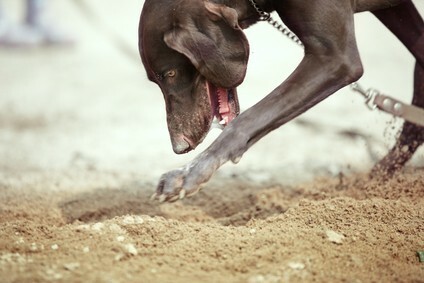 Annoying behaviors such as digging can really stretch the friendship between you and your dog. If you can identify why your dog is digging, and take steps to remedy it, you're well on the way to that neat and tidy garden that you can be proud of. Next post: Is Your Dog’s Chewing Driving You Nuts?